Dear Friends, if you would like to see some ravishingly beautiful and VERY unusual use of goldwork, please go to Goranka’s website. There you’ll see bras, corsets (YES! ), and purses, as well as goldwork pictures. By all means, take a look! Because I haven’t posted much, you may think I haven’t been stitching. Wrong! I’ve spent about 20 hours trying to learn the plaited braid stitch. I began working with Jane Zimmerman’s instructions and diagram. This is the ubiquitous diagram, the same one in every stitch book and online source I could find. I worked these vertically, starting out with a heavier braid than the design calls for and working at twice the scale, so I could see what I was doing (as I showed you a few days ago). My book said to work with a stiff thread, so I waxed some #8 pearl cotton and tried with that–the yellow samples. I also tried using the finer braid that the design calls for. A few times I got the stitch right for an inch, but then made mistakes. The example on the bottom right, worked in medium copper braid, is correct except for the loops being too loose as I began. What a mess! All the instructions said to work from the top down. But Megan told me about Linda Connors’ instructions which can be found at her Calico Crossroads website. Do go look at the photograph of her plaited braid stitch. She offers completely different instructions in a step-by-step tutorial. Wonderfully clear instructions for working the stitch horizontally. It makes so much more sense. Megan has reviewed her tutorial, for any of you who may want to learn this stitch. What a difference it makes. Before I saw the Calico Crossroads tutorial, I had already decided to try the stitch on canvas, thinking that the stiff, almost rigid canvas, would support and steady the loops so that I could see where to put the needle. So I pulled out all the canvas I had, including waste canvas of different counts, just in case, and a piece of Aida, count unknown. Fortunately for me, Linda’s tutorial is shown being worked on canvas. This is done exactly according to the instructions, but it doesn’t look much like the stitch is supposed to look. Getting better. It’s the tension that’s wrong. Once I learned the steps of the stitch, I found that the hardest part of making this stitch is maintaining a consistent tension, so that the loops are identical in size and just large enough to cover the lines. And another thing that makes this work so time-consuming is that the metallic threads repeatedly kink and gnarl, taking lots of time to straighten out as I go. Unattractive as it is, I did have some successes on this cloth. 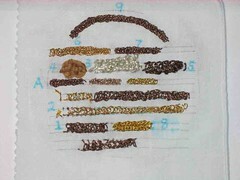 Number 8 is good, worked in Japanese gold medium braid. Number 2 was an attempt using Lurex 371. I is so much easier to work with than the metallic braid and there are some good sections, such as the middle of the row. Number 9 was my first attempt to work PBS on the curve. I didn’t find that difficult, no more difficult than following a straight line. I think the stitches may be a little too tight, though, too crowded. But it’s the correct width and size of braid called for in the design. Row A was pretty good, too. There, from left to right, I used #8 fine braid (which is what the design calls for), #4 very fine metallic braid, and finally, Japanese gold twist–the real metal thread. It is so much prettier than metallic threads. I find it almost impossible to stitch a 1/8″ line using #8 braid. Here’s how the needle has to be placed in order to get the line of stitches as close as I can to 1/8″. Just try this with the #22 tapestry needle on fabric stretched tight on a frame. This is 32 ct linen, similar to the linen I’ll use for the final stitching of the design. The row of copper plaited braid stitch is better but still not good enough. While I’m waiting for delivery of the #8 Japanese gold braid that had to be ordered for me, I’ve begun learning the trellis stitch. First, I used the silk thread called for. Terrible. Next I decided to try the stitch using #5 cotton pearl, the better to see what I was doing. That’s more like it. Then I used DMC cotton floss, which is about the thickness of the Needlepoint Silk. Why use up expensive silk thread for these attempts? This stitch needs to be anchored on all sides. I’ve gotten it right, but I need to stitch it inside an outline, a shape, that will support the looping, on-the-surface stitches. Hours and hours of trying and trying again, for almost two weeks. But I am getting there. I hope! As for my physics study, that is ongoing. I’ve entered 32 pages of rough draft and passages from the books that I may want to cite. But that’s for another post. P.S. What you don’t see is all the unstitched attempts. Thanks to all of you who sent Ernie birthday wishes. He has enjoyed them very much. He’s never been so well-celebrated! Yesterday we celebrated Ernie’s 84th birthday. I ordered Chinese delivered. For starters, we had egg rolls into which I had put birthday candles. With the egg rolls, we had Maker’s Mark premium bourbon, one of his (and my) favorite drinks. We’ve had this bottle for more years than I can remember. It’s very expensive and drunk only on very special occasions. As you can see, my egg roll also had a candle stuck into it. Of course, Ernie blew out both of them. With dinner we had a split of champagne. and quiet piano jazz by Bill Evans. And here are the flowers I had delivered to him. Alstroemeria, aka Peruvian lilies, shipped from the field in South America. A lovely little party to celebrate another milestone–84 years. When our granddaughter Melissa married in March of 2001, I had to buy a suitable outfit for the wedding. (Back then we could still make the trip to New Jersey.) The outfit I bought, from a catalog, was exactly what I wanted. However, it had no pockets, so I had to make something to hold a handkerchief, for I knew I would cry. Shortly before we knew the date of the wedding, I had bought Kreinik’s just-published Metallic Thread Embroidery. In it there was a project, something I’d never heard of–a balantine. It is a little sort of bag, just big enough to hold a handkerchief and a comb. Here’s the photo from the book. Canvas work in various gold and silver metallic threads and black silk thread. And here’s the design for the back, including gold paillettes with metallic threads and silk canvas work. You know I don’t like following instructions, right? First of all, I needed a color to go with my outfit, but I did use Kreinik’s choice of silk mori. Then, as I was following the canvas work stitch diagram, I discovered that the instructions were wrong. They called for a piece of canvas too small for the diagram! That forced me to improvise, and I wrote to them about it. Also, I didn’t care for the tassels. So here’s the front of my balantine. For the back, I rebelled and created my own design. This photographed a lighter tint of the very dark red silk, but the design shows up well. I lined it with orange silk velvet. And I made a cord to cover the edges. The camisole under the sheer tunic was orange, as was the lining of the pants. I had a wonderful time. This is my wedding outfit: I’ve worn it to two more weddings–my sons’s weddings and Ernie’s and my 35th anniversary celebration. And each time, I carried my ______ balantine. You can see enlargements at Flickr. Having decided to learn the most difficult stitch first, I’ll show you my first attempt at the plaited braid stitch. I’m working large scale, at least twice as large as the vine is supposed to be in the Elizabethan design, and I’m using a much heavier metallic thread–the better to see what I’m doing. It is daunting and fiddly and these stitches took me half an hour. Despite the appearance, the stitches are correct. I got the needle and thread in the right places, just not the right spacing or tension. I can see that mastering this stitch is going to take a lot of time. And there must be a better way to go about making it. I’m looking forward to Mary Corbet’s video tutorial on this stitch. Meanwhile, here’s my first try. I have not gotten off to a good start. You may remember that I am not good at following instructions, nor do I like to do so. But I’ve really been trying to do that with this Zimmerman design. As instructed, I carefully ironed the linen for the panel and for a practice cloth. (Yeah, I have a practice cloth for the practice cloth Zimmerman design. Then I “dressed the frames,” as Jane says. Next I got ready to transfer the design, again, per Jane’s earlier instructions, using graphite transfer paper. That’s when I saw that she directed me to transfer the Elizabethan design by placing the design on a light box and tracing it on the fabric over the design. The frames were not wide enough to fit over the light box. Now, I could have used the transfer paper method, but I was trying to follow the instructions. So I undressed the panel frame and got out my light box. Here you can see the light box and the design partially traced. Jane’s instructions called for tracing with a #2 lead pencil and having a white eraser at hand in case of need. That’s what I did, and it has never been so difficult to trace a design in all my experience. It took 45 minutes. The pencil kept catching in the spaces between the threads and I had to go over and over, slowly dragging the pencil. For the practice cloth, I rebelled. I used transfer paper under the design. Much, much quicker and easier. Here are the two results, both having been re-attached to their frames. The design of the panel, shown with the pencil with #2 lead and a white eraser, is darker, but the motifs on the practice cloth, done with transfer paper shown to the left, are perfectly satisfactory. So much for following instructions. On the practice cloth, I traced only those motifs that call for stitches I have not done before, and there’s plenty of room to learn and practice the dreaded plaited braid stitch. So far I’ve spent over three hours, just getting ready. And that doesn’t count the time for shopping.